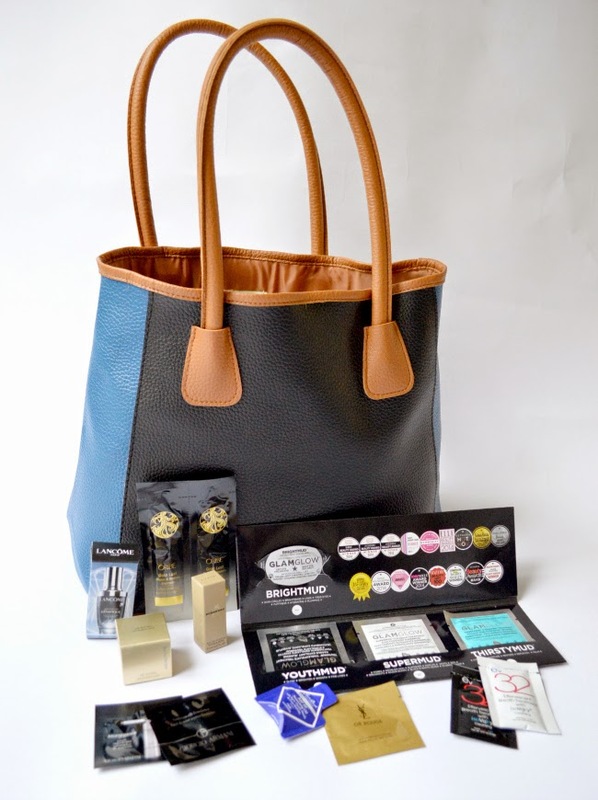 Estee Lauder is offering a this gorgeous tote filled with goodies when you purchase $75 in product at Neiman Marcus! The Estee Lauder beauty event is in stores and online until August 13. I’m kind of in love with this tote. It’s hard to believe it comes as a gift with purchase! The goodies on the inside are just the icing on the cake. Full size lipstick, eyeshadow pallet, lip gloss and more! If you looking for something to buy, may I suggest the Estee Lauder Pure Color Blush in Hot Sienna. I wear it everyday. I also received this beautiful beauty bag from Neiman Marcus. It’s filled with some awesome luxury samples include a Glam Glow sample kit! Since I have most of these products, I’m going to give to give this bag (2nd picture) away to one lucky reader! Giveaway will be open to US shipping addresses only. Must be over 18. Giveaway will end on Friday, August 15th at 11:59pm est. Enter below. Good luck! What is your favorite Estee Lauder product? I really love the Estee lauder volume mascara in brown, the brown just gives it a very natural look with my hair color, it’s makes a huge difference .. but you can barely see it! I have not tried Estée Lauder so I don’t have a favorite. But I love beauty products and would love to try some by Estée Lauder. As far as my favorite at Neiman Marcus I would have to say Cliniques lipsticks. And thank you for being so thoughtful to give your readers a chance to win. i love clinique facial skin care products like cleanser and moisturizer. i love this giveaway thanks so much! I had a darker-pink Estee Lauder nail polish a few years back that I really loved. I wish I remembered the name of it. I’d love to get it again but I remember it being pricey! The Estee Lauder Doublewear Stay Gel Eyeliner from Neiman Marcus is my fav! Moisturizer, yes…I use some everyday! I really love their revitilizing anti aging cream. I have never tried any of them before! Awesome contest! I wanna win…LOL! I love Estee Lauder Bronzed Goddess powder bronzer. I have never tried anything from there but would love to try! Thanks for the chance! I love Estee Lauder fragrances and Clinique facial cleansing products. Clinique products and nail polish. I love the estee lauder lipsticks they have. I’ve never tried their products but I would love to. My favorite products at Neiman Marcus are lipsticks and glosses from Nars. I also like an eye cream by Estee Lauder. Unfortunately, I purchased it before this promotion. Thanks for giving me the chance to win what I missed out on! Limited Edition Evening Out Set. I haven’t tried anything from Neiman Marcus! I can’t afford anything sadly! I love clinique lipsticks and there skincare!! Thank you for the giveaway!! I always go for Clinique…love their moisturizer. Love Clinique lipcolors and moisturizer! I’ve never tried any of their products, but I’d like to try Clinique! I actually haven’t tried any Estee Lauder products but I’ve been looking into their lipsticks-I heard so much about Crystal Baby years back and it’s been on my wishlist ever since! I love the estee lauder foundation!